On Friday, December 18, 447,000 popular infant car seats were recalled by the U.S. Consumer Product Safety Commission, the National Highway Traffic Safety Administration, and the Dorel Juvenile Group, Inc. The recall came after 77 separate reports were made about faulty bolts on the child restraint handles of over 40 different models. Loose bolts caused the handles to partially — or in some cases fully — break loose from the car seat base, causing injuries to at least three babies. What you can do now: If you own one of the recalled infant carriers, stop using yours immediately and order a free repair kit now by heading to the Dorel website or by calling Dorel directly at (866) 762-3316 between 8 a.m. and 5 p.m. EST Monday-Friday. Don’t forget, you can get your car seat installation checked out for FREE! Go to http://www.seatcheck.org to make an appointment. 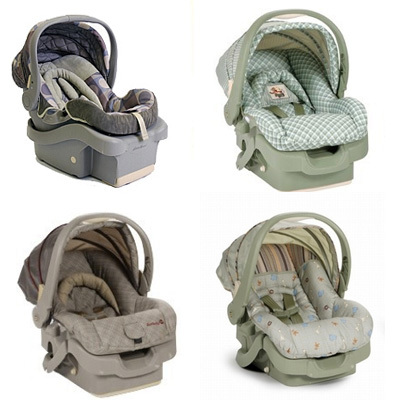 Click here for more about choosing the right baby gear for your baby. So, there’s this doctor out there promoting a book saying he can teach you how to get and keep your child free of germs. Oh really? Do tell. Barring bubble wrap, I’m not sure how this would be done. Yes, sickness is no fun, and if you’re a working mom — like me — it’s inconvenient, can lead to missed days at work, a cross boss and a miserable child. So, yes. Sickness bad. But germ free? I don’t know about you, but I want my kid to play with other kids and touch things and go to the store with me and generally be a kid, even if she catches a cold. Don’t get me wrong, I’m not going to host a pox party anytime soon, but I also refuse to hover over my three year old with a container of wet wipes. Sure, reasonable precautions are in order. We do frequent hand washing, and Dr. Rizvi has inspired me to run out and get some hand sanitizing gel for my impatient child, but a life in a bubble is not for my girl. Of course, if your child has compromised immunity for any reason, please disregard everything I just said. By the way, Dr. Rizvi is also featured in our podcast on Caring For Your Newborn. Check it out!